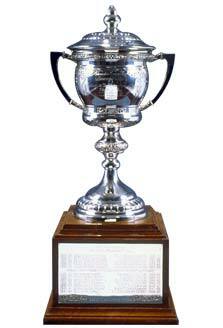 Lady Byng, wife of Canada's Governor-General at the time, presented the Lady Byng Trophy in 1925. After Frank Boucher of the New York Rangers won the award seven times in eight seasons, he was given the trophy to keep and Lady Byng donated another trophy in 1936. After Lady Byng's death in 1949, the National Hockey League presented a new trophy, changing the name to the Lady Byng Memorial Trophy. The trophy is an annual award given to the player adjudged to have exhibited the best type of sportsmanship and gentlemanly conduct combined with a high standard of playing ability. Leading winners: Frank Boucher (7), Wayne Gretzky (5), Pavel Datsyuk, Red Kelly (4).